Last night we took the quadcopter to our favorite beach-side restaurant, taking a little flight before dinner. It promised to be a great sunset, but as these things go it fizzled. 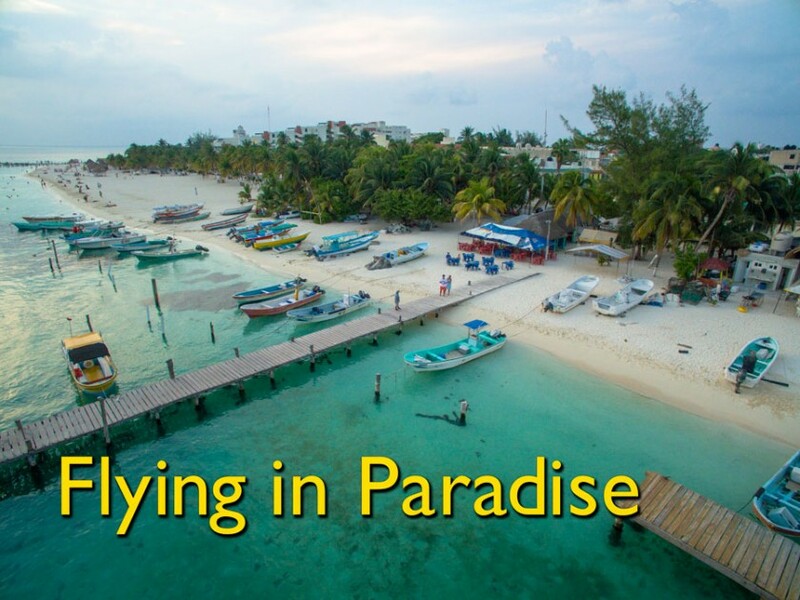 Although a bit disappointed that I was not going to capture one of Isla Mujeres’ stunning sunsets, I still flew a bit to get a feel for how to get the best angles on marinas, the ferry, restaurants, etc. As I was bringing the quadcopter back in towards the pier at Restaurante Velazquez, it dawned on me that I am learning how to fly in one of the most beautiful places on Earth. People look forward to coming to Isla for a week or two every year, and I live here every day (for the next few months, at least). Recently, these words actually crossed my lips, “I think I need something a little more exciting to photograph than the same old Caribbean again and again…” I should smack myself for even thinking that thought! This location is a double edged sword. Yes, it is a beautiful place, making it easy to shoot wonderful, grand images. You don’t have to work hard to find a fantastic photo opportunity. Of course, that is the downside… it does not facilitate learning how to turn a mediocre location into a fantastic photo opportunity! How lucky you are to be stationed in the Caribbean! So many opportunities for gorgeous photography. Especially if you take the quadcopter out for some sunsets. I wish I had that opportunity! Exactly! That is why we love being here! It is HARD to make a bad picture! We were just talking about where we want to take our sunset shots tonight! Oh, life has such tough decisions! Thanks for the wonderful shot of “paradise”. Since this was last September, have you had a chance to fly in a “mediocre” place yet? Nope… only southern Utah… Tuscany and eastern Italy… and then back to Mexico. I have gigs of video.. and just have not gotten around to putting them together! I’ve never been but from what I’ve seen, it’s really hard to get a bad angle when shooting at the Caribbean. I really have to work on getting some time off to travel there so I also have my own set of stunning aerial shots of paradise! I don’t think the picture can be more beautiful in any angle. Can you let me know what’s the quad you use for taking this image? This was a Phantom 3 Pro!